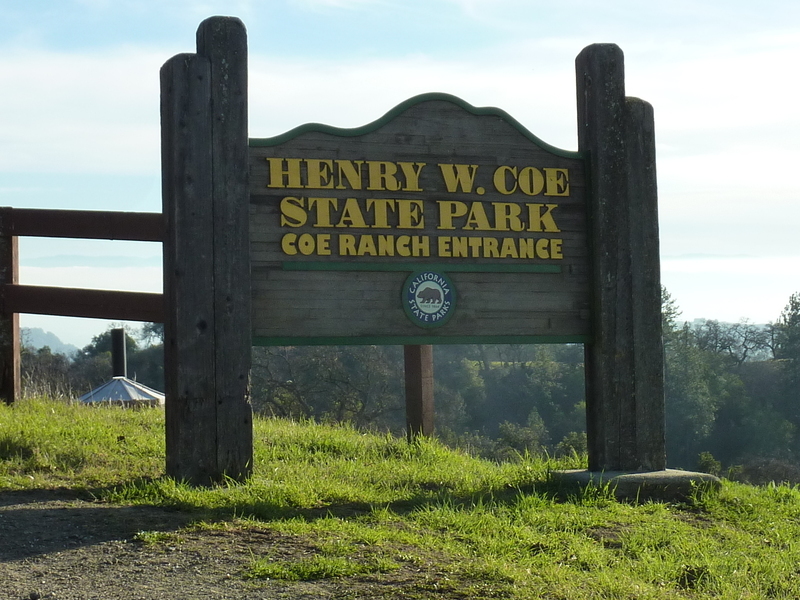 And so the next morning I was up at 6a and on my way an hour later, heading for Henry Coe State Park. For go-to big hikes, this is the best place in Santa Clara County, hands down. My choice today was the highpoint of Bollinger Ridge, a 3,600ft+ summit with something just over 400ft of prominence. It would require a total of 23mi and 7,000ft of gain, more than enough time and effort to work off that 1,600 calories. Bollinger Ridge isn't exactly in the park, however, or at least not all of it, including the highpoint. In fact that part of Bollinger Ridge that is part of the park is labeled as the Thomas Addition and No Public Access. I had visited Bollinger Ridge three years earlier when I reached the summit of Bollinger Mtn, but I didn't venture further north to the ridge's highpoint. San Jose, along with most of the Bay Area, was buried in dense fog which would not burn off until late in the afternoon. This made for a dreary drive down to Morgan Hill, but as I neared the park HQ around 2,500ft I found myself suddenly above the clouds with a beautiful blue sky overhead. This would make for a very lovely day with fog filling the lower valleys and crystal clear weather above. I paid my $8 day-use fee and started off at 8a. There were a handful of tents set up at the HQ campground with folks milling about and taking in the fabulous views, but I would see no one on the trail or roads until later in the afternoon as I returned. Past the ranger residence, I took the trail up to the highpoint of Pine Ridge, past an overlook bench with some fine views, to a grassy knoll where the highpoint is located, sans views, at 3,200ft. From here it was a series of descending and ascending as one first drops to the Little Fork of Coyote Creek near Frog Lake, then up to Middle Ridge, then down to the Middle Fork of Coyote Creek, then up to Blue Ridge at a junction near Mt. Sizer. There really are no flat areas in the western half of the park. I paused to take pictures of the creeks, overlook sites, manzanita and other plants in bloom as well as one of the many newts I found along the way. In descending to the northeast off Blue Ridge I reached the park boundary at an old, unsigned gate left permanently open. I recall on my visit three years earlier that this old road had not seen usage in a few years, but on this visit the roadway had been cleared and there were obvious tire tracks. Errosion is taking its toll on the road. Most of the roads in Henry Coe are not designed with water drainage in mind - they more often go steeply up ridgelines like firebreaks. The road I descended led to a small lake on the Middle Fork of Coyote Creek (this was my second crossing of the creek which wraps around Blue Ridge in a serpentine manner). Downstream is the larger Booze Lake with several cabins which I avoided altogether. This smaller lake sees some traffic, but has no permanent structures. The tent I had seen on the previous visit had been removed. Scrambling around the lakes outlet through some brush, I re-emerged on another road/firebreak ascending Bollinger Ridge. The road following the ridgeline here hasn't seen traffic in some time, aside from the numerous deer that ply the route. It passes through several property boundaries, most dilpidated. Though there is some brush in places, for the most part the route is clear enough to make for easy walking with outstanding views. Loma Prieta and the Santa Cruz Mtns rise above the fog to the west, and to the east could be seen the higher terrain around Mt. Stakes and the snowy Sierra in the distant background. The very upper reaches of Bollinger Ridge are composed of a mixed oak/pine forest. The highpoint itself is found just off the ridgline road and offers almost no views or other items of interest. For this one, the views are found along the way, not at the top. On my way back I chose at alternate set of connecting roads to get between Bollinger Ridge and Blue Ridge. The route took me over Bollinger Mtn and down to the Middle Fork about a mile NW of the small lake where I'd crossed it previously. On my way up from the creek I passed by a memorial sign placed alongside the road for Ernie Pavese who plied these hills up until 1966. Born in 1907, he would have been of the generation of my grandfather or great-grandfather. I was impressed that the sign had held up as well as it had over the past 50yrs. Further up the ridge I passed through more open gates at property boundaries, but it was unclear where the park boundary is. Just off the road is an old cabin site, someone's getaway retreat that has been left to rust in the elements. Inside the locked cabin can be seen items covered and stored away, seemingly forgotten. More descending and ascending - down Blue Ridge to the creek once more, then up to Middle Ridge and down to Frog Lake. As I was making the last climb up Pine Ridge from Frog Lake I caught up to an extended family of 6-7 with three small children making their way slowly up the ridge. They had underestimated the effort required of the littles for a visit to Frog Lake. How could you possibly think that a cheeseburger whose top bun is itself a grilled-cheese sandwich needs a side of two tacos, which in turn need a side of fries? This makes the KFC double-down seem sane. Poor judgement. I was lured in by the $6 price. That comes out to about 1/3 cent per calorie, btw.